On 3 June Ms. Tureen Afroz published an opinion piece in the Bangladesh Daily Star entitled ‘No Political Concession at War Crimes Trial’. Ms. Afroz is a government-appointed Prosecutor at the Bangladesh International Crimes Tribunal. She is required to hold herself up to a very high standard. Campaigning in the media for persons she has prosecuted to be convicted and punished is incompatible with such standards to which an officer of the court must adhere. Independent and impartial prosecutors are an integral part of any legal system based on respect for the rule of law. Their role is to ensure that crimes are fairly investigated and prosecuted in a manner consistent with the interests of justice. United Nations Guidelines require that Prosecutors at all times act impartially. This principle stems from the concept that ‘not only must justice be done; it must also be seen to be done’. This is a basic tenet of an open and transparent justice system. The duty to prevent any appearance of bias falls on the prosecution as much as it does on the judiciary. Ms. Afroz is right to raise awareness of the horrific crimes committed, by all sides, during the 1971 War of Liberation in what was then East Pakistan (now Bangladesh). Regardless of the numbers killed (this is a highly contested subject), the conflict was brutal and a large number of innocent people were killed, raped and tortured. Of this there can be no dispute. Nor can there be any tolerance for a culture of impunity under which such crimes were perpetrated. As such, the need to prosecute and bring to justice those responsible for these crimes is paramount – not only for Bangladesh, but for the recognition of international law as a fundamental process through which justice and human rights can be secured in today’s global community wherever and whenever such crimes may occur. Those persons who are alleged to bear individual criminal responsibility for such crimes should stand trial and if credible evidence against them proves them guilty beyond a reasonable doubt then they must be punished to the full extent of the law. Sadly, it is at this point where Ms. Afroz’s article of 3 June 2014 starts to ring false. Ms. Afroz, herself a lead prosecutor at the Tribunal, has made repeated public statements in the past offering thinly veiled ‘suggestions’ that those accused are clearly guilty. There is no question about this in her mind. She is supported in this by high-ranking ministers in the incumbent Awami League Government, as well as Prime Minister Sheikh Hasina, many of whom have repeatedly and unashamedly brandished each of the accused as guilty (in their respective cases with not even the slightest attempt to ‘diplomatically’ frame such announcements as veiled suggestions). The view expressed is that they are all guilty and they must be (indeed one already has been) executed. No discussion. For a prosecutor acting in these cases to continue to make such public statements during on-going proceedings is not only prejudicial and improper, it is a signal which can and should flag to those reading this (regardless of sympathies) that all is not right in the manner in which these trials are being conducted. There has been a veritable plethora of articles, publications, open letters and announcements from a broad and diverse range of respected international and state bodies as well as detailed exposés (a comprehensive and damning article in The Economist in December 2012 and published statements by the European Parliament and various UN Working Groups indicate the level of attention and condemnation these trials have received) about the entrenched corruption and judicial misconduct that has blighted the Tribunal since its inception. Perhaps Ms. Afroz forgot to mention these articles, publications, announcements and open letters in her article. Surely she would not seek to argue that the entire international community (and yes, there is practically a universal consensus) is conspiring against Bangladesh by criticising the trials? 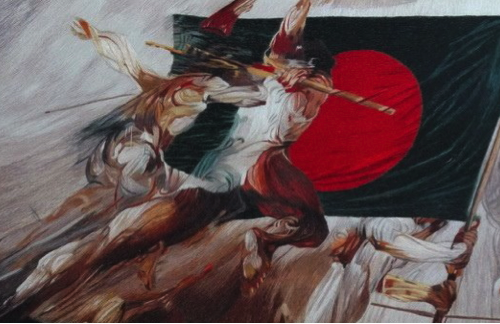 It is quite clear that the record upon which Bangladesh is to be judged now is quite different from that of the Allies at the end of the Second World War. Ms. Afroz claims, somewhat disingenuously, “it is clear that political orientation or association of the accused criminals have no bearing upon the ongoing trials at the Bangladesh tribunals…” This is quite false. If one thing is clear, it is precisely that the accused (all of whom are members of opposition political parties bar for one token trial where a former member of the Awami League was prosecuted to allow the government to suggest that politics were not a factor in the trials) are victims of a political vendetta. The government’s promise of their ‘convictions’ incidentally, was the driving platform of the Awami League’s election manifesto in 2009 when they came to power and again at the beginning of this year when they sought re-election. Moreover, the subsequent changes in law to deny those accused of their fundamental rights under the Bangladesh Constitution proved to be just the starting point. The legal framework has been repeatedly amended in order to ensure convictions and executions follow. Ms. Afroz claims that the accused have had their legal rights respected during the trials. This, again, is false. A cursory review of any of the judgments handed down to date will clearly illustrate that the trials have failed to meet even a token semblance of fairness in respect of due process and internationally recognised fair trial rights. Similarly, the conclusions drawn by the judges often rest upon inaccurate or, as has often been the case, wholly incorrect interpretations of fact and subsequent application of international law. It may well be worth reminding Ms. Afroz (and for that matter the Prime Minister) that Bangladesh in bound by the International Convention of Civil and Political Rights which obliges states to respect minimum standards of fairness for criminal trials. To say that Bangladesh have fallen short of meeting their international obligations in this regard is akin to suggesting that the Bay of Bengal is little more than a large puddle. Commenting on the standards of the trials in Bangladesh is often perceived as being an attack on Bangladesh’s sovereignty. Critics are often labelled as being anti-liberation and part of an international conspiracy. This is of course a ludicrous suggestion. Considering the extent of suffering the 1971 conflict caused this is perhaps understandable. However, one must distinguish between unjustified attacks on state institutions and legitimate concerns raised as to a fundamentally flawed process. To criticise the standards of trials is not to criticise the notion of ending impunity far less to challenge the nation’s liberation. In fact, one could reasonably argue that raising legitimate criticisms as to the process is perfectly consistent with the notion of ending impunity and ensuring accountability. It may be argued that Ms. Afroz is entitled to raise the issues in the same way that the defence is entitled to raise the question of fair trial. It is right that both prosecuting and defence counsel are held to the same high standards of professional ethics and integrity. However, there is a fundamental difference between the role of prosecuting and defence counsel. Defence counsel act solely in the interest of their client and are required to take all lawful and proper steps to ensure that their client receives a fair trial. That includes being critical of the process and requiring a State to comply with its national and international legal obligations. There is nothing contemptuous in pointing to the improper conduct of judges and prosecutors. Conversely, a prosecutor is required to demonstrate independence and impartiality. A prosecutor is required to demonstrate a clear separation from the parties to the proceedings and the issues in the case. A prosecutor is required to demonstrate professional integrity in terms of determining who is to be investigated and who is to be charged. The International Crimes (Tribunals) Act 1973 clearly states that the Tribunal has jurisdiction to try any person, irrespective of nationality. That would tend to indicate that the Tribunal has jurisdiction to try civilian and military personnel of Pakistani, Indian, Bengali or any other nationality. However, when a lead prosecutor uses terms such as the ‘racist regime of Pakistan’ it is clear that the lines between professional integrity and political activism have become irreversibly crossed. Ms. Tureen is first and foremost a human rights, or at least a political, activist. She has campaigned long and hard for the war crimes trials. There is nothing wrong with that. However, her appointment as a prosecutor and her recent writings on the tribunal demonstrate the complete lack of integrity that has characterised this entire ‘judicial’ process. This is not a response which should be interpreted as suggesting that those accused are necessarily innocent (although they must of course be presumed to be so until proven otherwise). Nor does it propose or advocate abandoning any attempt to prosecute those accused of crimes during the 1971 conflict. The point is to simply stress that if someone, anyone, is to face trial for any crime (regardless of nature, scale or context), that person has the right to a fair trial. It is an absolute right that cannot be compromised. It is a simple point. And it is on this point that there can be no concession.